This 77 year old man has had a bit of honeycombing at the bases since at least 2004. Radiographically c/w UIP. Biopsies not done and he has been stable for years (and FVC normal at 84% predicted). In February he developed worsenign cough and SOB. He was admitted and was hypoxic with the CT shown below. A cath was done showing normal wedge, normal CO/CI. A BAL showed only 184 cells half of which were macrophages. A TBBX was not done because he's on coumadin for afib and we didn't think it would add much to determining the diagnosis. SH, desk job all his life. In January, routine maintenance change of the humidifier pipes in his furnace. This may be a red herring but throwing it out there. No one else in household sick. 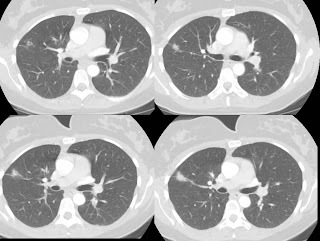 Was going to send him for open lung/VATs, but what do you think are possible etiologies? I also repeated autoimmune chemistries that had been negative in 2004. Although a benign lesion/resolving pneumonia were possibilities, I was concerned about bronchoalveolar carcinoma in this young non-smoker. A bronch was done - BAL cytology and tbbx were negative. We were in the right area (posterior segment RUL) and Fluoro did support this, but the biopsies came back as unremarkable pulmonary parenchyma. What would you do next? 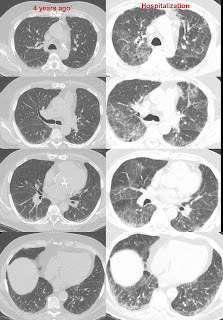 Some options would be follow with serial CT's - q 3 months, open lung, repeat bronch, or another course.